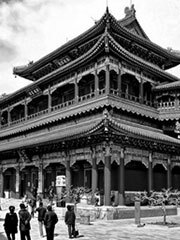 The Yonghe Temple (雍和宮), also known as the «Palace of Peace and Harmony Lama Temple», the «Yonghe Lamasery», or — popularly — the «Lama Temple» is a temple and monastery of the Geluk School of Tibetan Buddhism located in the northeastern part of Beijing, China. It is one of the largest and most important Tibetan Buddhist monasteries in the world. The building and the artworks of the temple combine Han Chinese and Tibetan styles. Building work on the Yonghegong Temple started in 1694 during the Qing Dynasty. It originally served as an official residence for court eunuchs. It was then converted into the court of the Prince Yongzheng (Yin Zhen), a son of the Kangxi Emperor and himself the future Yongzheng Emperor. After Yongzheng’s ascension to the throne in 1722, half of the building was converted into a lamasery, a monastery for monks of Tibetan Buddhism. The other half remained an imperial palace. The Yonghe Temple is arranged along a north-south central axis, which has a length of 480m. The main gate is at the southern end of this axis. Along the axis, there are five main halls which are separated by courtyards: the Hall of the Heavenly Kings (Tian Wang Dian or Devaraja Hall), the Hall of Harmony and Peace (Yonghegong), the Hall of Everlasting Protection (Yongyoudian), the Hall of the Wheel of the Law (Falundian), and the Pavilion of Ten Thousand Happinesses (Wanfuge). The Hall of Harmony and Peace is the main building of the temple. It houses three bronze statues of the Buddhas of the Three Ages, the statue of the Gautama Buddha (Buddha of the Present) is in the center, it is flanked by the statue of Kasyapa Matanga (Buddha of the Past, right) and the Maitreya Buddha (Buddha of the Future, left). Along the sides of the hall, the statues of the 18 Arhats are placed. A mural in the hall shows the bodhisattva Avalokitesvara. The Hall of the Wheel of the Law functions as a place for reading scriptures and conducting religious ceremonies. It contains a large statue of Je Tsongkhapa, founder of the Geluk School. The hall also contains the Five-Hundred-Arhat-Hill, a carving make of red sandalwood with statues of the arhats made from five different metals (gold, silver, copper, iron, and tin). The Pavilion of Ten Thousand Happinesses contains an 18m tall statue of the Maitreya Buddha carved from a single piece of White Sandalwood. The statue is one of three artworks in the Temple which were included in the Guinness Book of Records in 1993. The Yonghe Temple is located in the Dongcheng District of Beijing, near the northeastern corner of the Second Ring Road. The postal address is: 12 Yonghegong Dajie, Beixinqiao, Dongcheng District, Beijing.